There was a lot of great music in 2016, at jazz festivals, large and small. 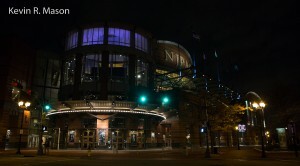 One of the last big festivals of the year was the TD James Moody Jazz Festival at The New Jersey Performing Arts Center (NJPAC) in Newark. 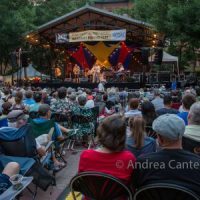 In its fifth year, the TD James Moody Festival has established itself as host of some of the finest jazz performances anywhere. 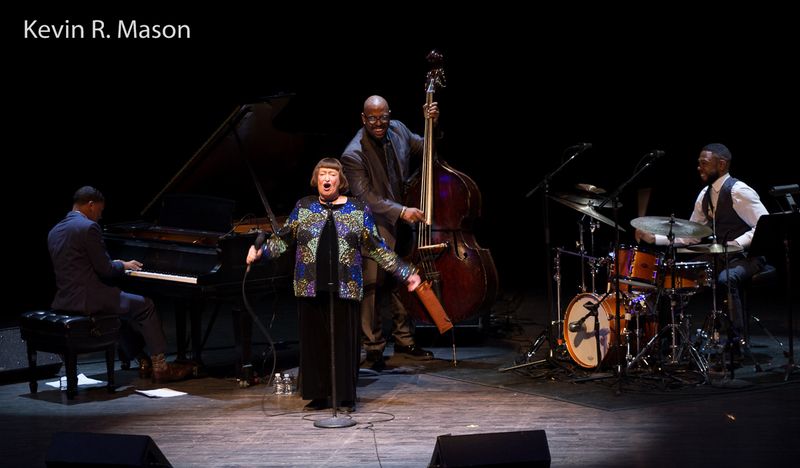 During October and November, NJPAC celebrated jazz and presented both icons and newcomers. There were tributes to Cole Porter, Dave Brubeck (with Dan and Chris Brubeck, and singer/pianist Hilary Kole) and Larry Rosen of GRP Records (featuring Lee Ritenour, Phil Perry, David Sanborn, and The Yellowjackets). Get on Up: A James Brown Celebration also became a heartfelt tribute to the late singer Sharon Jones, who was scheduled to appear, but sadly passed away the day before the concert. Dorthaan’s Place, NJPAC’s popular jazz brunch, hosted pianist/composer Renee Rosnes. It might have been one of the last festivals in 2016, but it was far from the least! 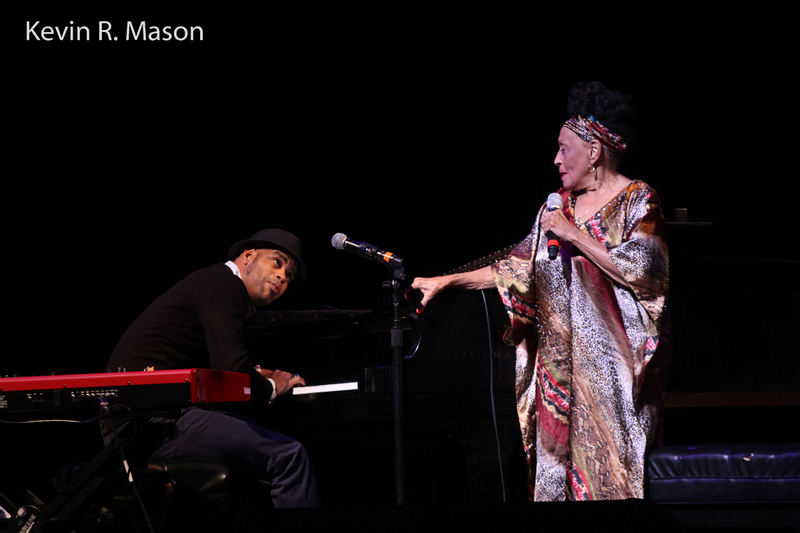 On October 15, legendary Cuban singer Omara Portuondo appeared with violinist Regina Carter and clarinetist/saxophonist Anat Cohen, multi-instrumentalist Roberto Fonseca, and members of the Buena Vista Social Club. The show was part of Omara’s “85 Tour,” in celebration of her 85th birthday. Looking glamorous in a sparkly caftan, and younger than her 85 years, Omara enchanted the audience with a voice as clear as a bell. 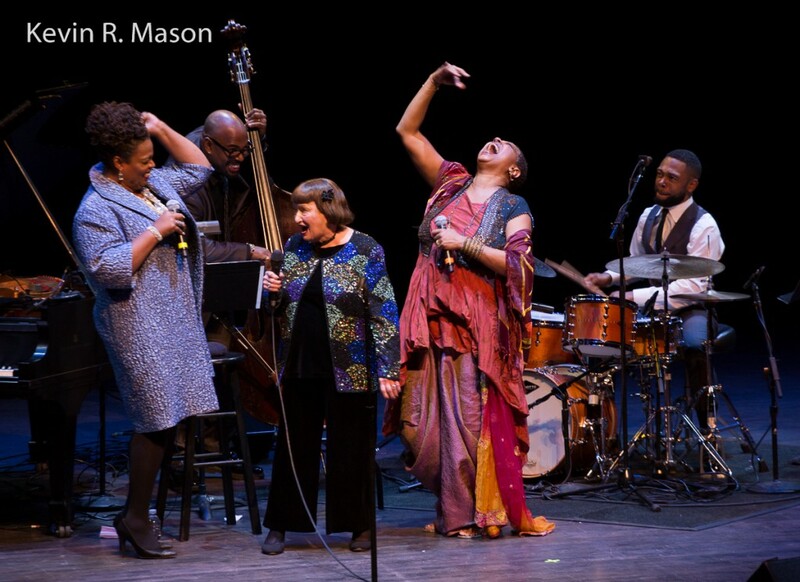 Anat Cohen and Regina Carter provided outstanding accompaniment, and both did such exceptional solos that audience members often burst into applause right in the middle! Anat and Regina also did a friendly duel that managed to be funny and thrilling at the same time. Several people brought maracas to the concert, and played them with enthusiasm whenever the beat moved them, which was often. Although most of the music was sung in Spanish, you really didn’t need to know the language to enjoy the show, and there were some well-known standards like “Besame Mucho” and “Quizás, Quizás, Quizás” (“Perhaps, Perhaps, Perhaps”). Omara had people singing and dancing in the aisles and the box seats. Oh, it was a party! On November 1, Don Katz, CEO of Audible, Inc., introduced the evening, speaking passionately of author Ralph Ellison as teacher, mentor, and friend, and the night was dedicated to Ellison’s lifelong love of jazz. Historical photographs and films helped weave all the elements of the show into a richly beautiful tapestry. Music was provided by Wynton Marsalis and vocalists Catherine Russell, Angélique Kidjo, and Patti Austin, backed by Andy Farber and His Orchestra. Joe Morton employed his considerable acting skills on several dramatic readings. Catherine Russell, in dazzling garb, sang a heartfelt “Black & Blue,” followed by a film of Louis Armstrong performing the same song. 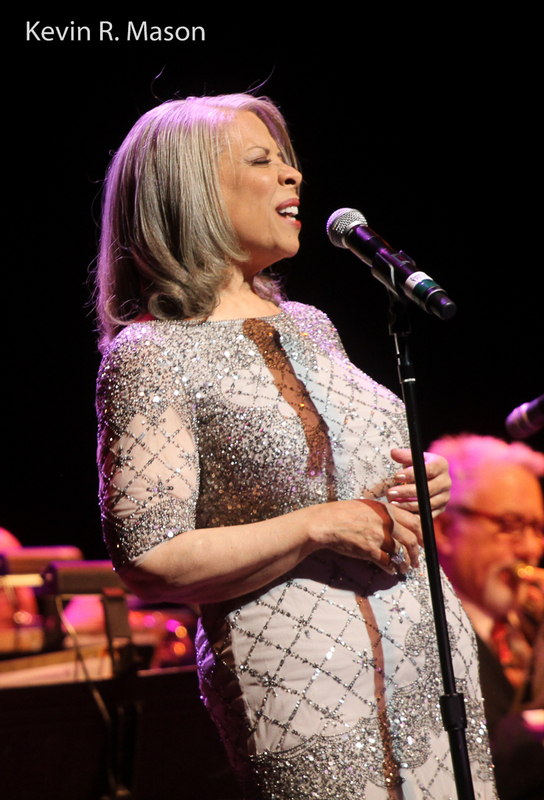 Elegantly clad Patti Austin did a lively “In a Mellow Tone.” It was a remarkable show, without introductions, but the impressive line-up made introductions unnecessary. Reminiscent of the great old nightclub revues, there was one fabulous performance after another. After a short intermission, they showed a clip of Ralph Ellison reciting a powerful poem about drums and stolen voices. Wynton Marsalis related his deep respect for Ralph and his wife Fanny, and played a lovely interlude. Patti Austin joined Marsalis for a haunting “Stardust,” and the duet was so wonderful, the two artists hugged with joy. Angélique Kidjo displayed energy and charm on a bluesy “He Ain’t Got Rhythm” that brought the house down, and poet/rapper Talib Kweli read Ellison’s musings about artist Romare Bearden, with Bearden’s paintings projected behind him. 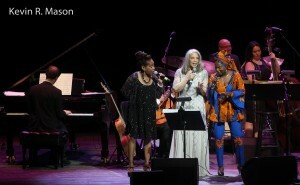 Angélique, Catherine, and Patti sang “Love You Madly” together, and Morton talked about Minton’s and the legends who appeared at the club, bringing the stories to vivid life. The night ended with a fantastic jam session. Musical history lessons should all be this brilliant, entertaining, and inspiring! NJPAC Day of Swing: Celebrating New Orleans! Saturday, November 19 was filled with seminars, classes, and concerts for the entire family. Christian discussed the importance of allowing musicians to be themselves, stressing that it made Miles Davis a great leader. “Wayne Shorter was already Wayne Shorter when he joined the Miles Davis band.” McBride thinks the greatest leaders encourage and challenge musicians, but don’t try to direct or change them too much. He said you don’t get an apple when you want an orange. He once heard Dianne Reeves say of her musicians, “I never think of them as a backup band. I’m actually in my band.” One of Christian’s pet peeves is a long solo, saying, “Do I really have that much to say in every solo?” and garnering some laughs. He gracefully segued into a great jam session with vocalist/teacher Jackie Jones and a student, commenting, “I always like to play more than talk.’’ Although there are many demands on Christian McBride’s time, when he finds time to relax, he loves to meditate, and enjoys a quiet, darkened room, even if only for five minutes. Sometimes he’ll chill out in his car before a gig. McBride’s illuminating session was one of the highlights of the day. 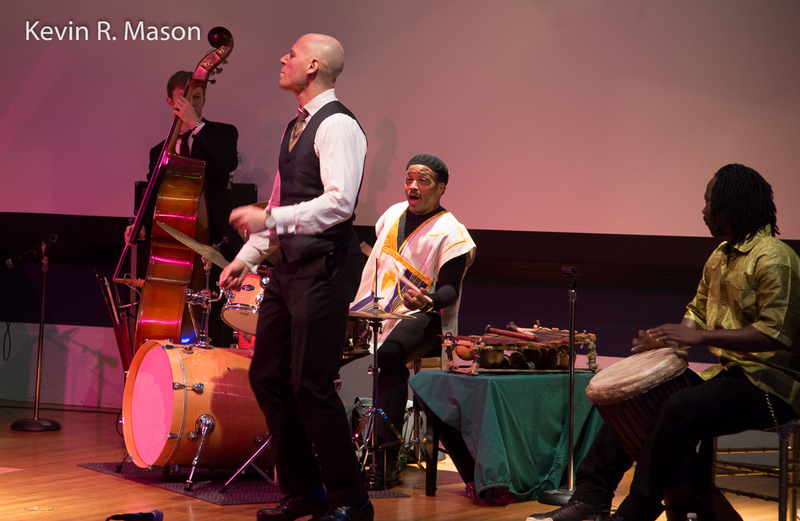 Winard Harper & Jeli Posse gave a free performance at Newark Museum as part of WBGO’s Kids Concert series. Percussionist Winard Harper, whose lifelong jazz apprenticeship has taken him around the world, was joined by pianist Norman Simmons, tenor saxophonist Mike Lee, bassist Vince Dupont, and tap dancer A.C. Lincoln. This dynamic show played to a standing-room-only crowd. 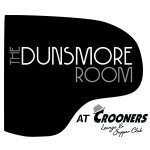 Special guest, vocalist Antoinette Montague, did a great call-and-response version of “Let the Good Times Roll.” Antoinette and dancer A.C. Lincoln brought several children on stage to dance, and the good times did roll, for everyone in the place! 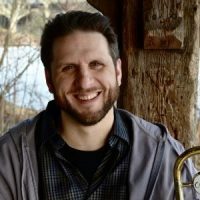 Winard likened music to food, and said while you might eat junk food, you need nourishing food to survive, and jazz is nourishment for the soul. A group of young artists performed a stirring “God Bless the Child,” and there was more audience participation on “It Don’t Mean a Thing (If It Ain’t Got That Swing),” closing a fun, interactive concert for the entire family. Sarah Vaughan Celebration. On Saturday evening, the Day of Swing culminated in a star-studded celebration of “The Divine One,” Sarah Vaughan. Linda Moody, wife of the late saxophone virtuoso James Moody, talked about the first time she met Sarah at a James Moody concert and how gracious Vaughan was. The Christian McBride Trio, with pianist Christian Sands and drummer Jerome Jennings, started the music in style with “Tangerine.” McBride stated, “It is truly an honor to pay tribute to Newark’s own!” Sheila Jordan was the first vocalist, and sang a funny song about Charlie Parker, who really loved Sarah. 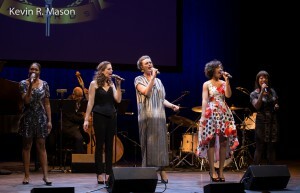 Jordan followed with “Autumn in New York,” inspired by the times Sheila used to see Vaughan on 52nd Street, and she infused the song with feeling, wit, and charm. Sheila’s a born storyteller who had just celebrated her 88th birthday. After the audience sang “Happy Birthday” to her visible delight, she finished her set by touching her toes, showing her youthful flexibility, humor, and ageless spirit. 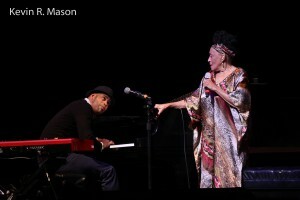 Pianist Peter Martin accompanied Dianne Reeves, the vocalist many people call the heir apparent to Sarah. 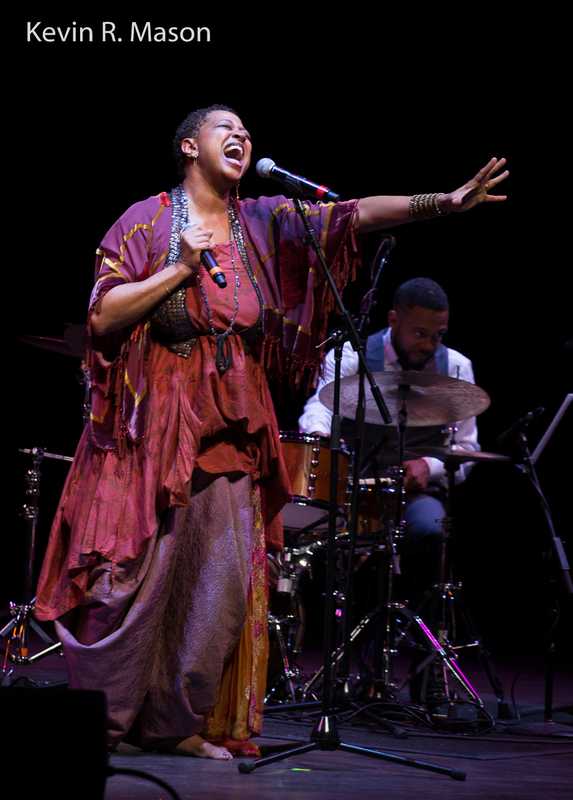 Dianne praised Lisa, singing, “A chair becomes a throne, when Lisa Fischer sings that song!” Then, Dianne sang and scatted an improvised song about Sarah, and spoke of Vaughan with such admiration, recalling the many times she heard her sing live. It blew her mind to hear how differently Sarah performed songs each time. Reeves did thrilling versions of “Misty” and “Lullaby of Birdland,” putting her own stamp on each. 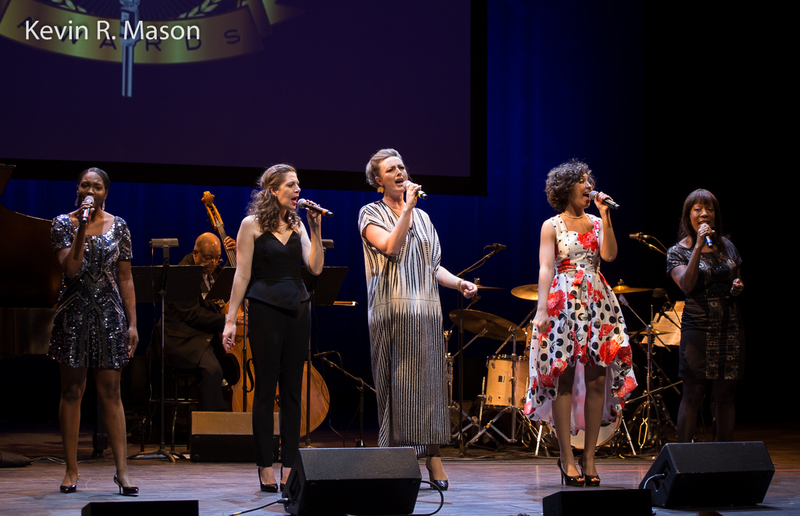 For the finale, the three vocalists returned for an encore written by Jordan, called “Workshop Blues.” The women scatted and collaborated with such beautiful camaraderie that the audience responded with a prolonged and richly deserved standing ovation. Sarah Vaughan International Jazz Vocal Competition: The SASSY Awards. During the deliberations, Arianna Neikrug, 2015 SASSY Award winner, discussed her experiences in the past year, including recording her first CD, and sang a lovely version of “I Didn’t Know What Time it Was,” backed by Musical Director/pianist Sergio Salvatore, bassist Lisle Atkinson, and drummer Buddy Williams. After making an unenviably tough choice, the judges announced the results: 2nd Runner-up: Lauren Scales; 1st Runner-up: Sinne Eeg; and the winner of the 2016 SASSY Awards: Deelee Dubé! 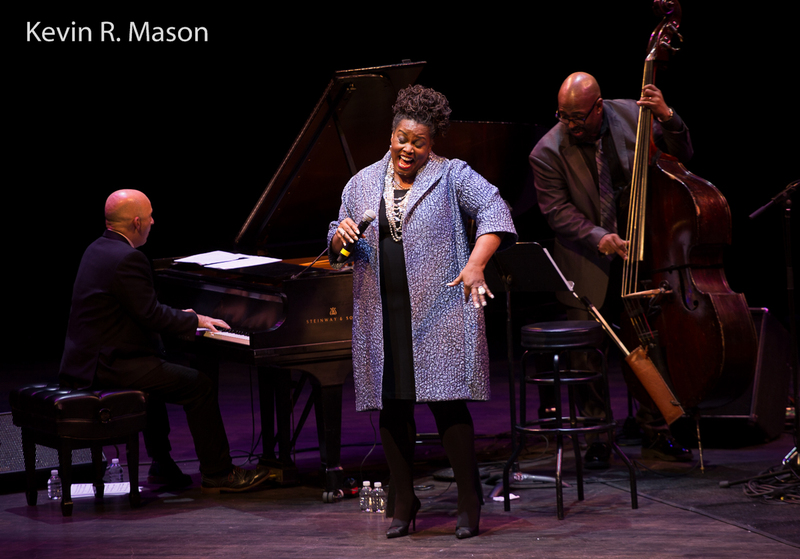 Following tradition, all five finalists took the stage, and sang a Sarah Vaughan medley that included “Misty,” “Brokenhearted Melody,” “Tenderly,” and “Just Friends.” This was a wonderful finish to the 2016 TD James Moody Jazz Festival! 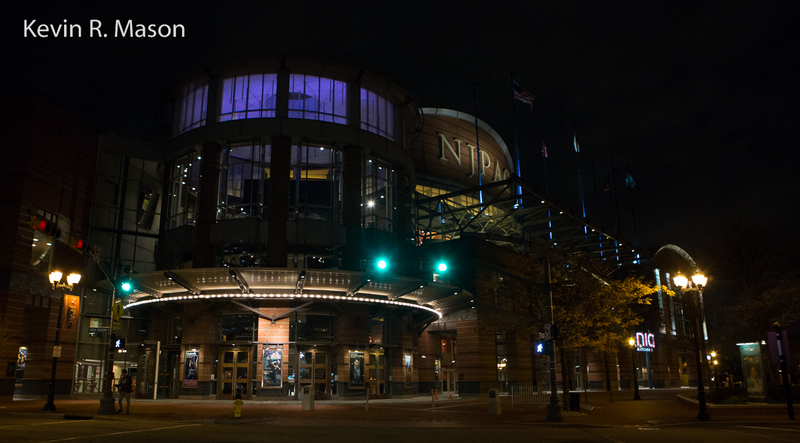 NJPAC’s TD Jazz Series will continue presenting events throughout 2017. 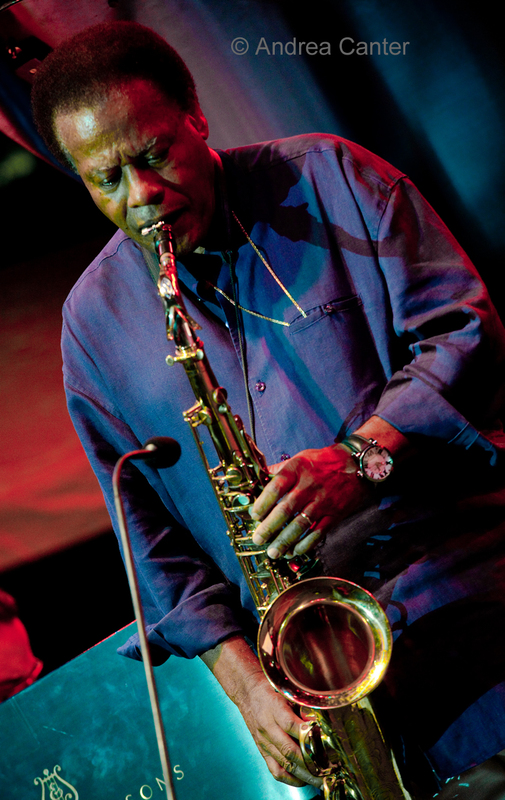 Legendary Newark saxophonist Wayne Shorter will participate in a weekend in his honor. 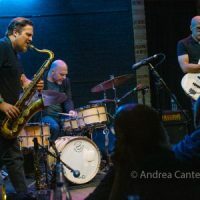 On April 22, there will be a screening of Wayne Shorter: Zero Gravity, a documentary directed by Dorsay Alavi, followed by Shorter reuniting with Weather Report bandmates for a show, Weather Report and Beyond Reimagined. The next afternoon, Shorter’s work is sure to be a topic at Christian McBride with Esperanza Spalding: One on One, a discussion and concert with the two acclaimed bassists. 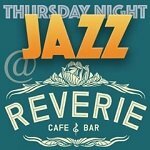 That evening, electronic jazz and R&B icon Herbie Hancock joins the Wayne Shorter Quartet in Prudential Hall. 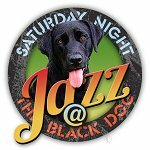 Dorthann Kirk’s jazz brunch, Dorthann’s Place, just hosted Toshiko Akiyoshi and Lew Tabackin, and the brunches continue with baritone Kevin Mahogany on February 12, bluesman Rob Paparozzi on March 12, and the Bucky Pizzarelli/Ed Laub Duo on April 2. 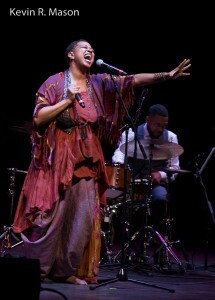 For more information on upcoming events at NJPAC, go to: www.njpac.org.